Rocky Mountain Helicopters Inc.; crashed at Meeteetse, WY : approximately 2 minutes into the flight, the pilot experienced a slight 1 to 1 vibration throught the cyclic. This type of vibration is accociated with main rotor dampers and the pilot stirred the cyclic in an effort to purge air out of the blade dampers. This eliminated the problem, however, it recured and could not be eliminated. The vibration increased to the point of loss of control. An emergency landing was attempted with touchdown occuring at about 60 kts. The helicopter came to rest inverted and was largely consumed by post-impact fire. Catastrophic failure in a low cycle fatigue mode consistent with a secondary cause, and due to the short term vibrations. In addition to fatigue, there was an evidence of plastic deformation due to vibratory loads from the damper systems. Fire damage prevented additional failure analysis. 3 seriously injured and 4 slightly injured. 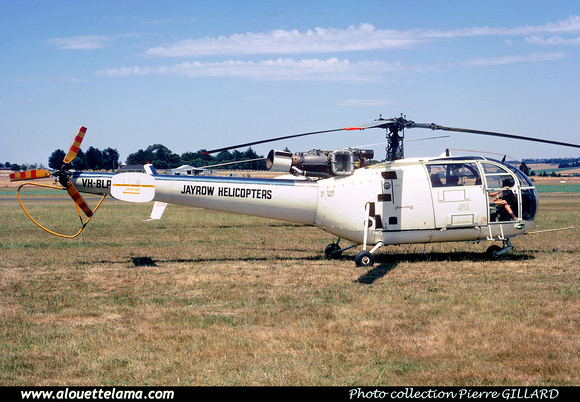 VH-BLP Eurocopter (Aérospatiale) SA316B Alouette III MSN 1827, Jayrow Helicopters - Australia - 02-1972 - Photo Pierre Gillard collection. 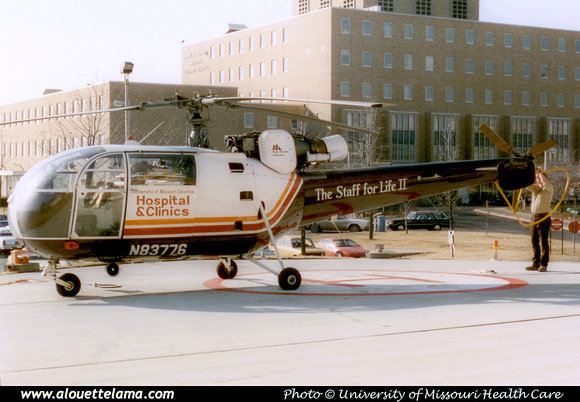 N83776 Eurocopter (Aérospatiale) SA316B Alouette III MSN 1827, 1827, Rocky Mountain Helicopters, opf University of Missouri Columbia Hospitals & Clinics "The Staff for Life II" - U.S.A. - 1984/85 - Photo University of Missouri Health Care. Dernière mise à jour/Last update : 12-02-2014. L'usage des logiciels Firefox ou Safari est recommandé. The use of Firefox or Safari browsers is recommended.